Learn reading music, snare, concert, rock, jazz, big band, Latin, and recording from Bob Belanski. Education: Bob studied at New Mexico State University where he received his education in music. He has had private studies with Education Director for the Ludwig Drum Company – James Sewrey, National Rudimental Drum Champion Frank Aresnault , jazz and studio drummer Ed Thigpen, and all-star drummer Louie Bellson. Having apprenticed with James Sewrey (a founding member of the Percussive Arts Society), Bob is an expert in rudiments and technical snare performance. He stresses the importance of proper technique, reading music, and developing a deep groove across several musical mediums. 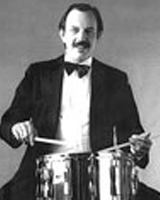 Teaching: Bob taught percussion instruction at New Mexico State University. He was Assistant Percussion Instructor for James Sewrey. He has taught percussion privately for over twenty years in the San Francisco Bay Area. He has also served as a percussion consultant for several Bay Area colleges and secondary schools. Students will learn Rock, Jazz, Big Band, Latin, Hip-Hop, Funk, and traditional classical styles. Performing: Bob is a versatile musician with extensive experience in a variety of styles. He has played with The Glen Miller Orchestra, The El Paso Symphony Orchestra, Jazz Pianist- Vince Guaraldi, Cal Tjader, Elvin Bishop, the famous R&B group The Drifters, and Chet Baker. In addition, Bob has played for comedians Bob Hope, Flip Wilson, Pete Barbutti and Steve Turre of the Saturday Night Live Orchestra. Bob has recorded for Fantasy and Warner Brothers as well as private record labels. For fans of Peanuts and Charlie Brown: Bob is the drummer on Vince Guaraldi’s album: Charlie Brown Suite and Other Favorites.